This post was originally published on March 29, 2015 and republished on February 22, 2018 with updated content and photos. All cultures have traditions which celebrate certain holidays with food. 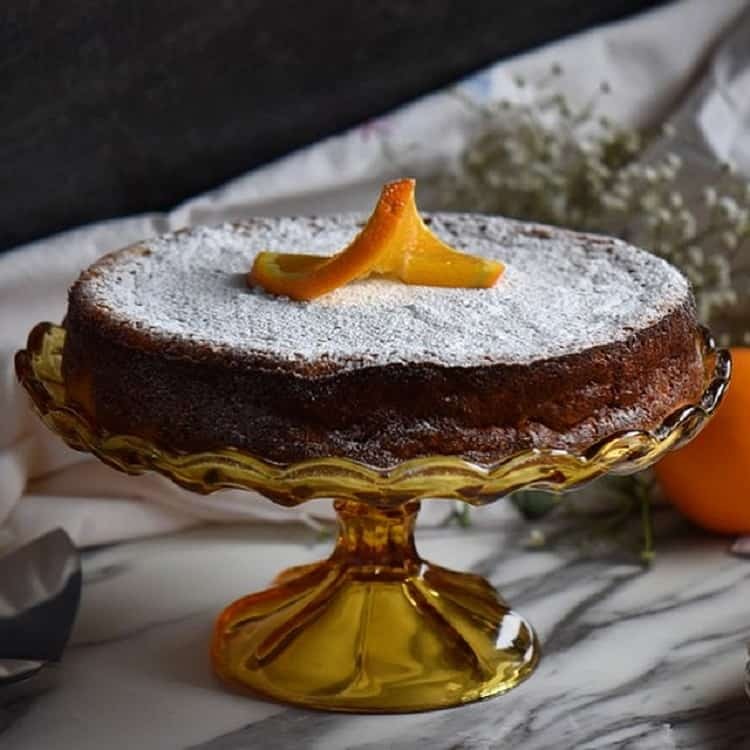 Italian culture exemplifies this love affair with food, so much so that I sometimes get the impression that as a culture we are either preparing food, eating food or talking about what food we are going to make…continuously. Take for example, Easter. There are so many foods traditionally made during this period. Just take a look at some of the Easter recipes my family makes. One of my favorites is this Italian rice pie or Torta di Riso. Do not be discouraged that this recipe has three parts to it. Ingredients are easy to assemble and can be started simultaneously, once you organize yourself. You have to anticipate that anything that has arborio rice in it has just got to be good (just like this recipe for Creamy Rice Pudding). 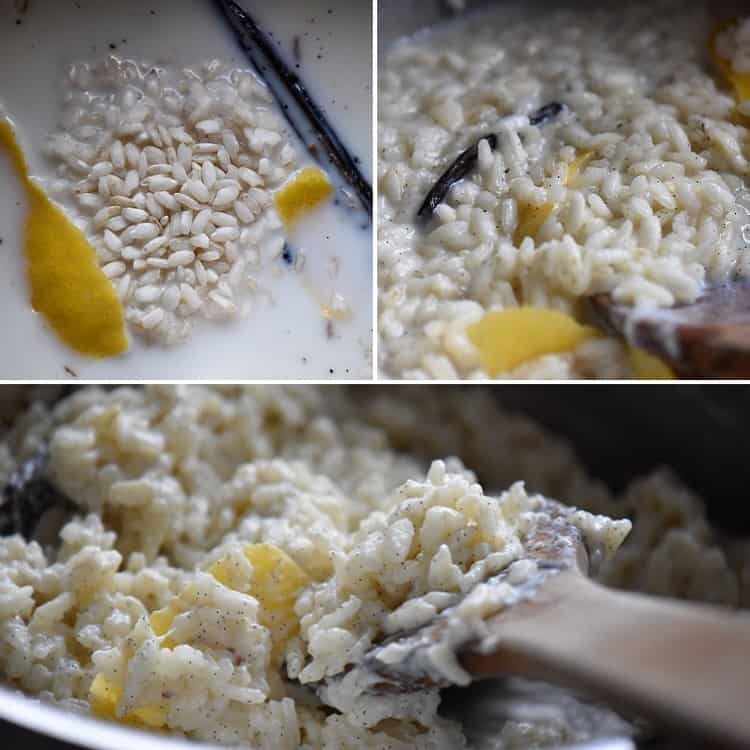 The rice is simmered, with a cover (on low heat) in milk and flavored with lemon peel and a vanilla bean. If more convenient, you can replace the vanilla bean with two teaspoons of vanilla extract. The milk gets absorbed by the rice in about 20 minutes. Make sure to stir constantly towards the end of the simmering process, otherwise you will get one sticky mess. It’s okay if the rice is still a little chewy as it still needs to be baked in the oven. Set the rice mixture aside to cool down as we prepare the crust and the rest of the ingredients for the filling. PRO TIP: Never rinse arborio rice before using -we don’t want to lose the starch that contributes to the creaminess of the final product. I have to admit, the first time I attempted this recipe, I was dumbfounded by this crust. But much to my surprise, this mixture works and forms a wonderful crust for this ricotta pie when it gets baked with the filling. Usually pies will call for a short pastry dough, aka pasta frolla which needs to be rolled out. 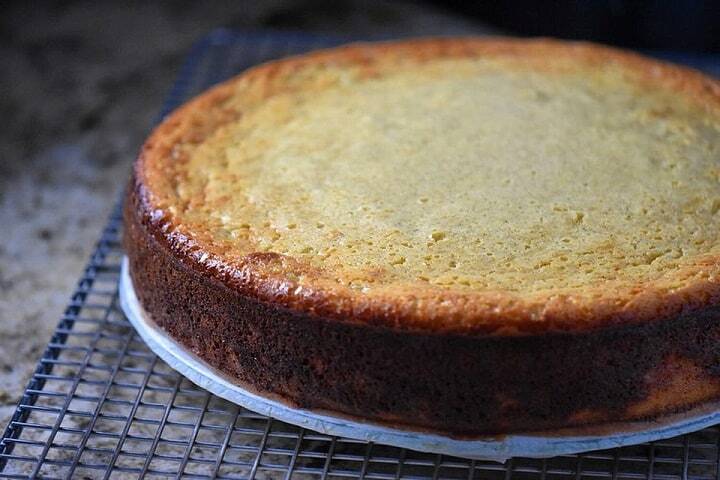 For this rice ricotta pie, there is no need to roll out any dough. Let me explain. Simply whisk the ingredients together in a medium sized bowl and pour it into your spring form pan or pie plate. 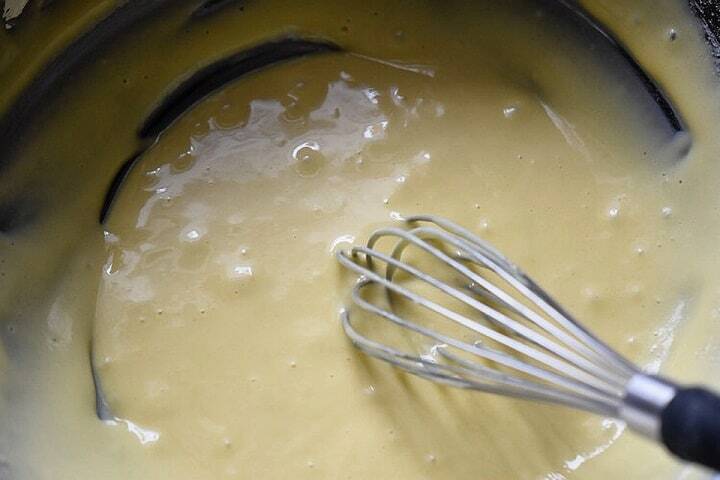 Spread the batter to cover the entire surface of the bottom. Set it aside while we prepare the filling. UPDATE: Some of you have successfully made this pie without the crust. I recently tried it and was very pleased withe the results. If you are looking for a ricotta pie recipe without crust, simply eliminate this part. At this point, the crust part of this pie is at the bottom of our pan (unbaked); the rice is cooling off; and we are ready to start whisking some eggs. This part of the recipe is very straightforward. Feel free to use your stand mixer, a hand held mixer or even a whisk. In a large mixing bowl, whisk the remaining ingredients together -one by one. Finally, incorporate the rice with a wooden spoon, making sure to break up any clumped rice. The mixture will be a little on the liquid side. 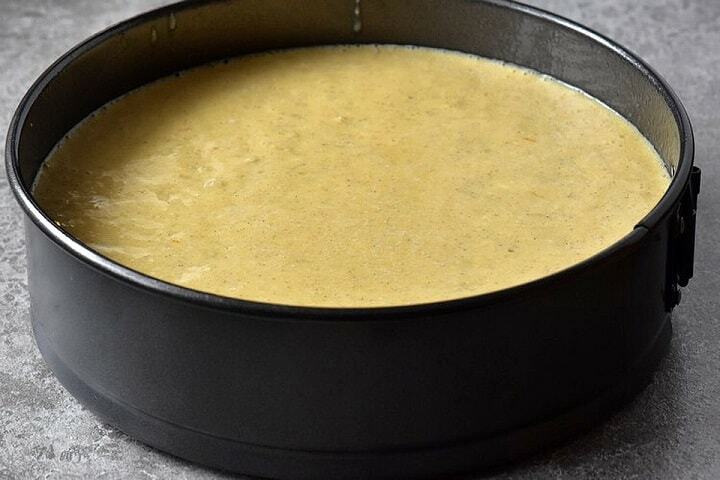 Simply pour this batter over the (uncooked) crust in your pan. The only thing left to do is to bake your rice pie.. Depending on your oven and the type of pan you use to bake your pie, this can take 50-60 minutes. Usually, it is done when the center is set. Once your rice pie has baked and cooled down, it only needs a nice sprinkle of icing sugar and you’re done. The pie can be eaten on the same day at room temperature. If making in advance, bring to room temperature and refrigerate for up to 3 days. When ready to serve, bring to room temperature by taking out of the refrigerator one hour before serving. It’s back to my Mom’s Italian background for this recipe. 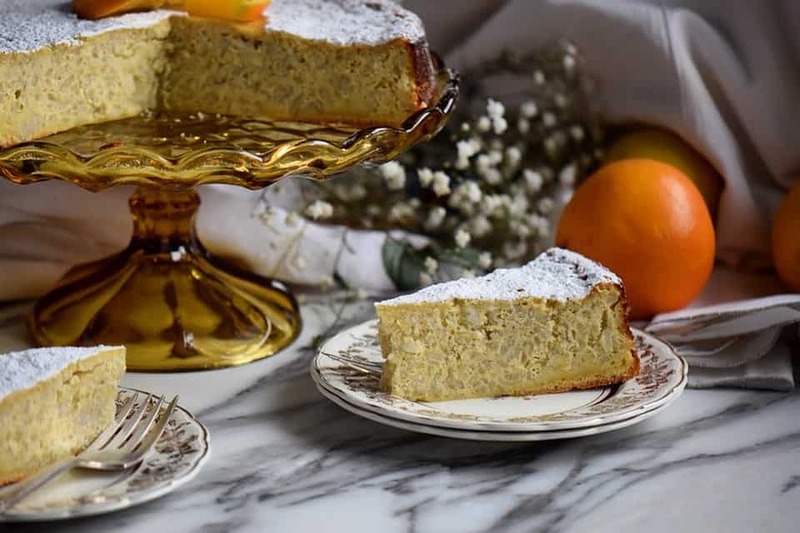 Originating from Benevento, in the Campania region of Italy, this rice pie recipe would often be part of the endless food line-up for the big traditional Easter meal. 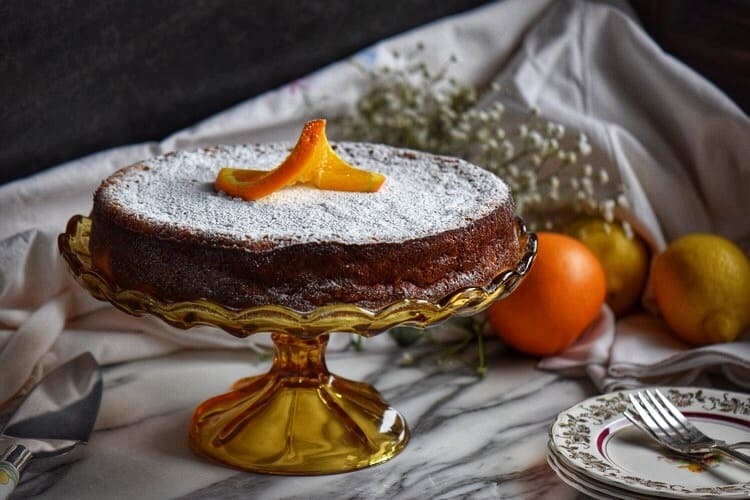 As you know, Italian cooking is extremely regional and as a result, there are endless variations of recipes . Of course, it is only natural that one’s personal preference will almost always gravitate toward childhood flavors. At least that’s been my reality. This Italian Easter rice pie was one of those recipes that was extremely appreciated by both family and friends. So much so that my mom would get requests to make it throughout the year. Whenever I make this pie, so many wonderful memories of my mom come alive and that’s the greatest gift of all. My mom would bake this ricotta pie in a 9 x 13 large rectangular baking dish. I will usually bake this pie in a deep 10″ ceramic pie plate. Based on a few comments that I have received over the years, I tried baking it in a spring form pan and was very pleased with the results. I am very grateful to all that commented and shared their experience making this Easter pie. 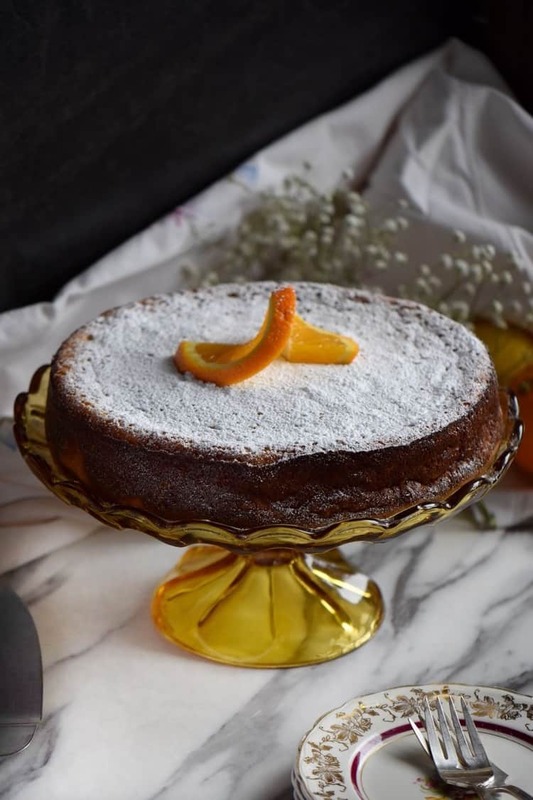 If you prefer a pie without the rice, take a look at this recipe for Ricotta Pie, another perfect recipe for Easter! 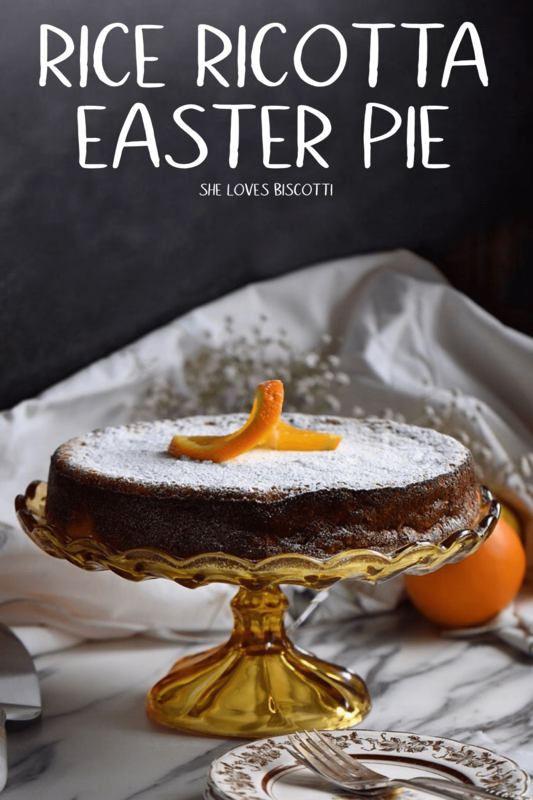 ★★★★★ If you have made this Italian Ricotta Easter Pie Recipe, I would love to hear about it in the comments below and be sure to rate the recipe! Combine milk and rice in a large saucepan over medium-high heat. Add salt, vanilla bean and lemon peel. Stir. Once the milk begins to simmer, reduce heat to low, cover slightly and stir occasionally until the milk is absorbed; about 15-20 minutes. Stir constantly toward the end of this time to prevent the milk from scorching. The rice should be cooked but still firm as it will continue to cook in the oven. Remove lemon peel and vanilla bean. Preheat the oven to 350℉/175℃. Position rack to middle. Spray a 9½-inch spring form pan with non-stick spray (can also use parchment paper to line the bottom of the pan. Set aside. Beat eggs with hand held beater or whisk. Add sugar, oil, lemon zest and whisk together. Sift flour and baking powder together and add to egg mixture. Spread mixture at the bottom of pan. In a large mixing bowl (of stand mixer), with whisk attachment, beat the eggs until light and frothy. Can also use a hand held blender or whisk. 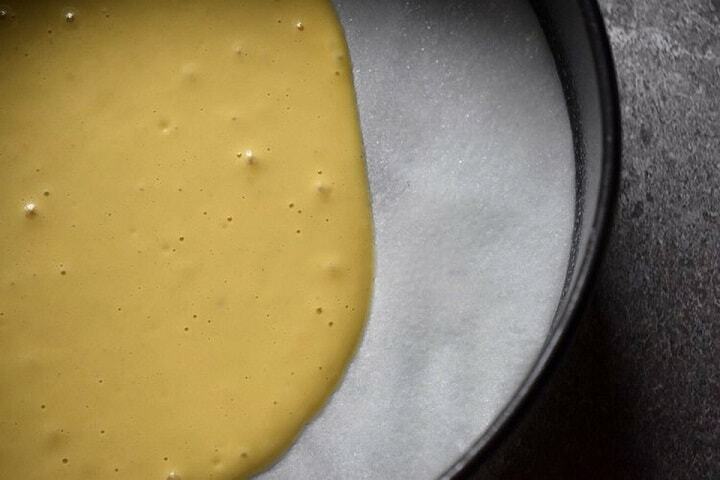 Gradually whisk in the sugar. Beat for 1-2 minutes. Add ricotta, zests and cinnamon. Whisk until incorporated (about 1 minute). With a mixing spoon, gently combine the rice mixture, breaking up any clumps of rice. Pour into pie plate (over unbaked crust). Bake for about 60 minutes or until golden and top bounces back when lightly touched. Take out the ricotta and eggs from the refrigerator about 30 minutes before starting your recipe. If you do not have a spring form pan, you can use a deep 10 inch pie plate or a 9 x 13 large rectangular baking dish. The total baking time will depend on what pan you use. To check for doneness, gently shake the pan towards the end of the baking time; if the center jiggles slightly, it is done. Look for an area of 2 inches (5cm). The rest of the pie should also feel firm. Can you use a pre-made pie crust for this? Hi Mary, although I’ve never tried, I think it should turn out great with a pre-made pie crust. Can I add crushed pineapple? Hi Mary, yes there are a few readers that have commented that they have added crushed pineapple with great success. Thanks for stopping by. Can I double this recipe? What changes do I make, if any. You know….. sometimes doubling ruins a recipe…. I don’t have a spring form pan…possible to make in a pie dish? Hi Rosie! Oh yes, absolutely. Depending on the size of your pie plate, you might want to make 2. Happy Easter Rosie! I made this Easter Pie today. It came out wonderful & your instructions were very easy to follow. My family is also Italian American so I remember my Father buying this pie all the time during the holidays. Happy Easter & thank you for this recipe. Thank you so much Barbara ♥ I am so happy to hear you enjoyed this Easter Pie. Appreciate you taking the time to comment. Wishing you and your loved ones a Happy Easter. Have you experimented with any gluten-free flours for this? I’d love to try it. Hello B.A. I have not, but one reader tried making the pie without the crust and it turned out wonderfully. I have tried twice this week and it turned out great both times. I am in the process of updating the recipe to include this as an option. Please let me know if you have any other questions. Great comment. Thanks for stopping by.